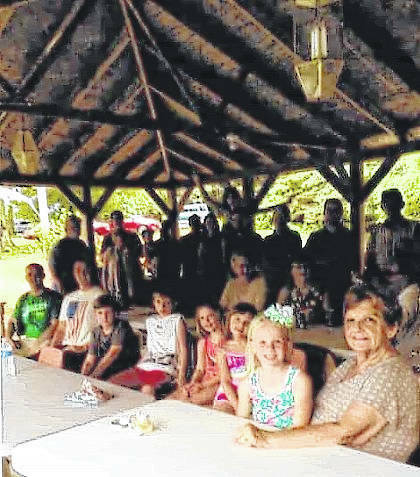 Courtesy photo Thirty-six people attended the recent Corwin family reunion at the home Ed and DeeAnn Speece in Bucyrus. Relatives are the descendents of the late Paul and Bertha Corwin, of Galion. Ed Speece is the son of their oldest daughter, the late Betty Corwin Speece of New Winchester, Ohio. Guest came from Bucyrus, Galion, Mount Gilead, Nevada, Oceola, Poland, Marion, Canfield and Lewis Center. Everyone enjoyed an afternoon of reminiscing and a potluck dinner. Thirty-six people attended the recent Corwin family reunion at the home Ed and DeeAnn Speece in Bucyrus. Relatives are the descendents of the late Paul and Bertha Corwin, of Galion. Ed Speece is the son of their oldest daughter, the late Betty Corwin Speece of New Winchester, Ohio. Guest came from Bucyrus, Galion, Mount Gilead, Nevada, Oceola, Poland, Marion, Canfield and Lewis Center. Everyone enjoyed an afternoon of reminiscing and a potluck dinner. https://www.galioninquirer.com/wp-content/uploads/sites/38/2017/10/web1_Corwin-Reunion.jpgCourtesy photo Thirty-six people attended the recent Corwin family reunion at the home Ed and DeeAnn Speece in Bucyrus. Relatives are the descendents of the late Paul and Bertha Corwin, of Galion. Ed Speece is the son of their oldest daughter, the late Betty Corwin Speece of New Winchester, Ohio. Guest came from Bucyrus, Galion, Mount Gilead, Nevada, Oceola, Poland, Marion, Canfield and Lewis Center. Everyone enjoyed an afternoon of reminiscing and a potluck dinner.